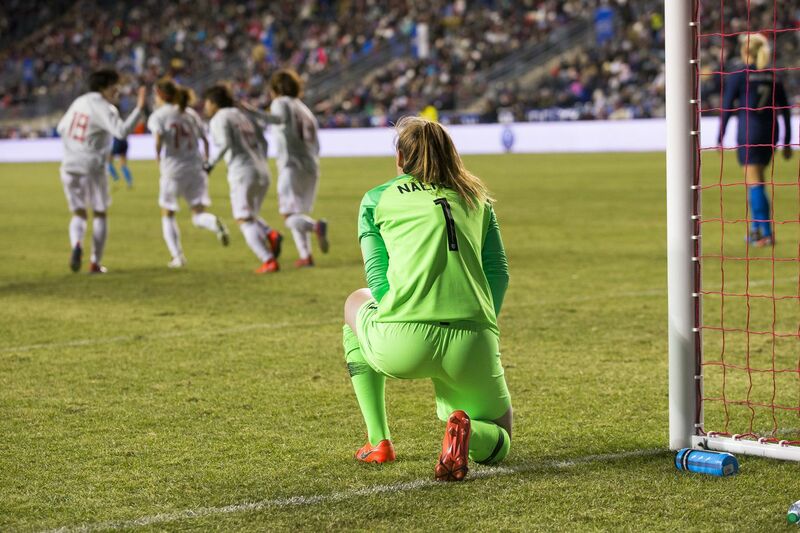 United States goalkeeper Alyssa Naeher watches as Japan celebrates the late goal that left the Americans with a 2-2 tie in the SheBelieves Cup at Talen Energy Stadium. For all of the U.S. women’s soccer team’s vaunted attacking firepower, there’s been a suspicion for a while that coach Jill Ellis’ playbook has one major flaw: a lack of steel in the central midfield. On Wednesday night at Talen Energy Stadium, that flaw got exploited in a major way. Japan scored a 91st-minute goal to leave the Americans with a 2-2 draw on the opening night of the SheBelieves Cup. Ellis prefers to deploy two attack-minded players and one disruptor in the central triangle of her 4-3-3 setup. In this game, she went for Rose Lavelle and Mallory Pugh — normally a winger — in front of Julie Ertz. No other defense-oriented midfielders, such as Sam Mewis or McCall Zerboni, played. In the game’s early stages, that trio looked solid. The Americans had plenty of time on the ball, and kept possession away from Japan’s skilled midfield. They got rewarded for that in the 21st minute, when Tobin Heath dashed down the right wing and squared a pass that Megan Rapinoe coolly finished. From then through much of the second half, the U.S. controlled play. But the Americans were unable to get a second goal, and in the 67th minute, Japan tied the game. The Japanese crafted an incisive buildup from a throw-in near midfield, and when Tierna Davidson failed to clear a pass by Emi Nakajima into the 18-yard box, Nakajima smashed a first-time shot past U.S. goalkeeper Alyssa Naeher. Nine minutes later, Ellis sent on Christen Press and withdrew Pugh, putting Press out wide right and moving Heath into Pugh’s central slot. Press started instigating immediately, sprinting down the right wing to pull Japan’s defense out of shape. On the Americans’ next thrust downfield, Press swung in a cross in that Alex Morgan put home to put the U.S. up, 2-1. Having reasserted itself, the U.S. seemed on course to seal the win. But Japan rallied again, and Yuka Momiki capped off a lightning-quick counterattack with the late equalizer. Ellis has been caught living on the edge before, especially in last year’s Tournament of Nations, but was able to seal wins by bringing in Mewis or Zerboni as substitutes. In this game, Ellis didn’t do that. Her only late move was replacing Morgan with Carli Lloyd. Ellis defended herself afterward, dismissing the second goal as a one-time mistake. Rapinoe, however, acknowledged that something bigger might have been amiss. “We just get caught sometimes going forward too much, taking too many risks, and we just need to control the game when we have it in hand,” Rapinoe said. “Obviously, when you get into the World Cup, you play more defense than you probably play offense." Keep that last sentence in mind as the World Cup draws nearer.